Coaching a sports team takes much more than just designing effective plays and forming successful teams. When you coach youth soccer, you’ll be spending hours with impressionable kids. This alone makes it very important that coaches model good behaviors and give the young players a great experience. 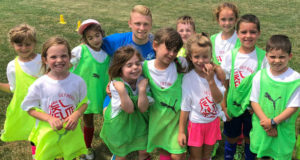 Before you dive into a season of soccer camps and soccer training programs, know these qualities that make soccer coaches the best of the best. When you coach soccer, you’ll need a style of communication that successfully trains young players while also staying on the side of positivity. Children tend to internalize negative words and tones, which can then affect their ability to play and learn. As a soccer coach, you will also need to regularly communicate with the parents of players, other coaching staff, game officials, and tournament administrators. By being able to communicate positively, you will build better relationships with all of these people. The players on your soccer teams or at soccer camps will have a hard time listening to you if they don’t trust you. One of the best ways to build trust with children is to show kindness and be friendly. Every kid on the team is going to have a different personality. Taking the time to get to know each of these individual personalities will go a long way in building a fruitful connection between you and your team. When you know your players better, you’ll be better able to develop game strategies that cater to each individual. By showing friendliness, you’ll also encourage your players to be nice to one another. While many kids will be on the team because they want to play the sport, recent surveys have shown that 62% of children who play organized sports in the U.S. participate so that they can interact with their friends. Encourage this comradery between all team players, but remember to maintain a level of professionalism. In the end, the point of coaching soccer teams or teaching at soccer camps is to help your team win. While you will certainly see that success in some games, you will probably lose others. Being a good motivator is key to keeping your team going in the face of loss. Even if your team wins, you need to be able to motivate your players to do better every game. Try using words of encouragement and continually develop their skills to remind them of their goals and missions. Coaching soccer can be extremely rewarding, but you can’t jump into it without preparation and thought. Embody these qualities while you coach the little ones, and remember to always have fun.